Forget about tangled USB cables. Extending out to 40", and retracting down to 4.25", this Micro-USB cable is the perfect addition to your work or travel bag. Keep the juice flowing. Charge and sync any Micro-USB device with Hi-Speed USB 2.0 technology. 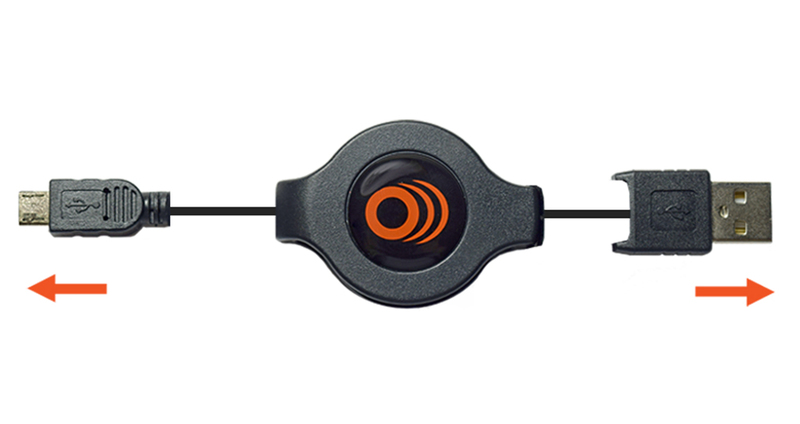 Extends up to 40 inches, and smoothly retracts in under a second for a tangle-free cable. Pull the cable at both ends to extend to one of 5 different lengths. Cable makes an audible click at each length. Retract the cable to simplify your life… and your travel bag. Only 4.25” long when fully retracted. Talk about compact. Works with all Micro-USB devices like the Samsung Galaxy S7, Motorola Moto G5 Plus, or Fire HD 10 Tablet. Click the button below to add the Retractable Micro-USB Charge & Sync Cable to your wish list.